Laughlin NV in the 1970s no-one comes here on business unless they are in the fun business. 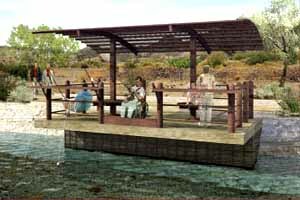 We come for the food, the drink, the easy-going atmosphere, the fishing, and the golf in the unique Colorado River setting. Laughlin is still Nevada. There are ten casino-hotels now, nine strung like beads along the Colorado downriver from Don Laughlin’s original Riverside — his South Tower went up in 1994, the last major addition to Laughlin’s skyline — and a tenth, The Avi, 16 miles south on the Fort Mohave Tribal Reservation. 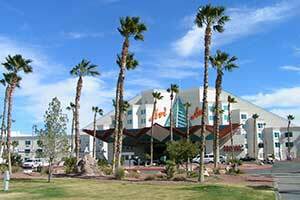 Laughlin was on a pace to overtake Las Vegas in size and sizzle when I first visited in the early ’80s. A huge burst of investment was underway. With the addition of the Ramada Express (now the Tropicana Express), Harrah’s and Flamingo Hilton, the buoyant municipal mood was predicting a newer, younger, brighter and bigger Las Vegas taking shape along the Colorado. It didn’t happen. Some of the existing properties added new towers, and a few new resorts were built — there were seven by 1982 — but casino development slowed to a stop in the 1990s while the magnificent madness of Las Vegas continues to this day. 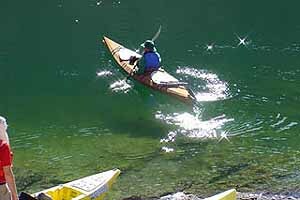 There are lots of ways to enjoy the river here, including kayaks. 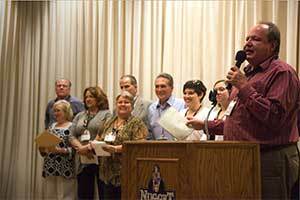 There is a change going on in Laughlin, but it doesn’t show from the outside. Even hotels that don’t have new owners are renovating and upgrading. 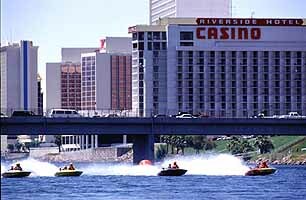 Just now a number of the casino properties are making major capital improvements, upgrading rooms, restaurants and the overall Feng Shui: The Riverside has just renovated of its Prime Rib Room, recarpeting and wall-covering its public spaces on the first two floors, and installing flat-screen tvs in the guest rooms. was the first home built in Laughlin. These days the manager lives elsewhere and the residence is being renovated as a vacation rental. 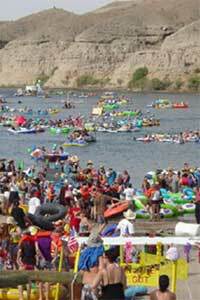 There are some big events in Laughlin each year. The Laughlin River Run is an ear-shaking motorcycle rendezvous held each spring, and Rockets Over the River just after dusk on July 4th, is a 20-minute fireworks display that brings spectators out to view it along the River Walk. The Mardi Gratta River Regatta(August 10 this year) is a pleasantly wacky way to have fun on the river. It actually begins with a Friday night pre-party. Survivors gather on Saturday morning for the canoe/kayak/standup paddleboard race, wakeboard and wake-skate competitions. The Regatta itself is a magnificent procession of floating objects with human beings aboard (Life vests required), on a 9-mile 3/4 hour river float trip. Inner tubes abound, but decorated rafts and home-made vessels of all types are carried along by the current in a festive and hilarious procession. 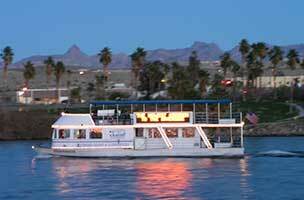 Apart from the casinos — just outside their back doors, in fact — Laughlin’s main attraction is still the Colorado River. In late August, afternoon temperature 110 or higher, the river is a busy playground, with swimmers, sunbathers and babies playing patty-cake at the Harrah’s beach, little water-skeeters zipping up and down the river, water taxis buzzing from one hotel to another, water-skiers bouncing along behind sleek boats and sending up rooster-tails behind them, and the Little Belle gliding grandly on its sight-seeing cruises. above the sparkling waters of the Colorado, a haunting monument to greed and bad judgment: the skeleton of the 4,000-room Emerald River Casino Hotel, financed with junk bonds and abandoned before completion. Turn right (north) at the Needles Highway to tour the residential part of town. 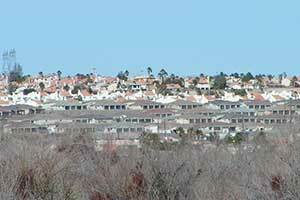 For the first ten years there weren’t 100 residents because there was no place to build homes. 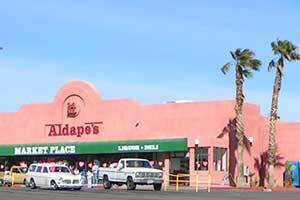 Now you’ll see a profusion of red tile roofs to the north as you approach what might be called Uptown Laughlin: a supermarket-anchored shopping center, with insurance offices and pizza places. Laughlin has almost all the attributes of any mainstream American town, in other words, except that most everything is brand new — there has certainly never been a neater, cleaner boomtown in Nevada history. I’ve been coming to Laughlin for 40 years and I finally met a local — I don’t mean Bullhead City local, I mean Laughlin local. And by Laughlin local I include people who don’t yet live here full time . . . people in pre-retirement mode who own town houses and rent them to Canadian snowbirds each winter. Let’s call this one Linda. “I grew up in Carson City,” she told me. “My husband and I have lived in California for a long time and we missed the Nevada spirit of independence, and the desert. 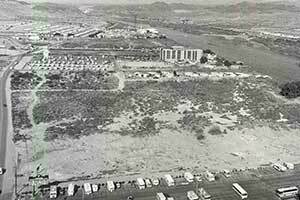 We found Laughlin almost by chance, and with the casinos along the river and the residential neighborhood well removed, and without any way to grow bigger, it seemed just right to us. “We love it here,” she told me. “And we love the desert. We go out and play in it the way I played on C Hill when I was a kid. 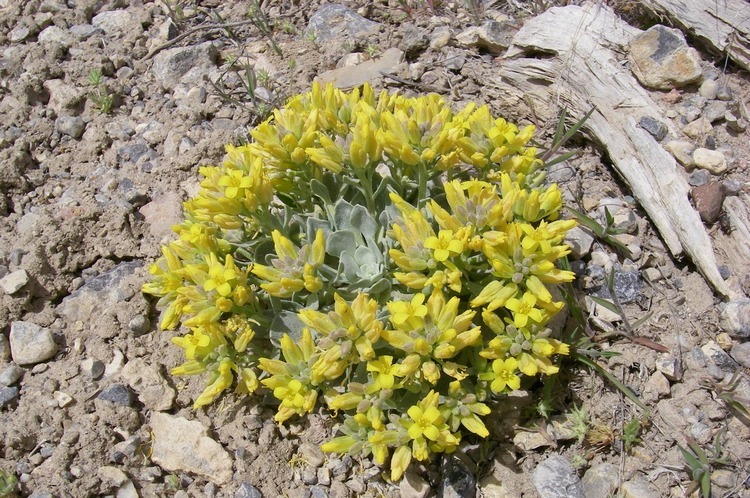 It’s magical — in the spring there is such a burst of wildflowers! And if you go down to the river in the early morning you’ll see people in their 70s and 80s waterskiing before the kids get up. Population in 2010 was 7,323, all of them living under the red tile roofs to the west of the Needles Highway or at Avi on the Fort Mohave reservation. 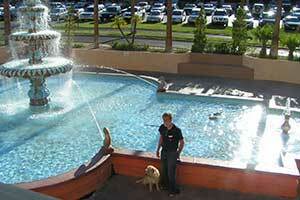 the prosperity of far southern Nevada, and Laughlin’s only other residential district. The trout fishing is still as great a lure as the gambling games for many visitors, and some of them bunk up in their RVs, enjoy the fishing and the mild winter temperatures, and only enter the casinos for an early breakfast before heading off to catch lunch and dinner. access at several points along the way, including at the dam itself, where it ends at a grassy playground and picnic area. 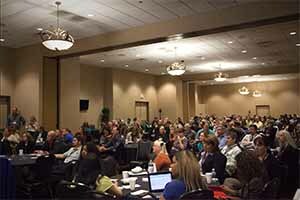 Here’s a quick follow-up on the recent Rural Round Up in Pahrump. The photo above shows Impresario Larry Friedman with the Tourism Territory chairs about to present the Voluntourism awards for the year. You will find all the winners and other details here, and more photos here. Quick notes from beyond the mountains: Who says Vaudeville is dead? In our high-tech age this antique form of fun — live, not on YouTube — packs a wallop. In “Biggest Little Sideshow” vaudeville has been reimagined for the Sammy’s Showroom stage at Harrahs Reno, and it’s terrific! Singing! Dancing! Pretty women doing astonishing things before your eyes! It’s not at all raunchy, it’s all about talent and skill, presented in fast-paced, highly-polished Show Business style by a haughty MC. We’re talking sword swallowing here! Eating fire! And it doesn’t seem nostalgic or old-fashioned at all, it seems almost revolutionary. I was dazzled, enthralled and utterly entertained. For $25, a big bargain. . . .
My posse was down to one when we arrived in Laughlin. I don’t know where the other one went. Much of life is a mystery to me, actually, but as long as I have a full belly and a warm place to sleep I don’t worry about it. We checked into Harrah’s for two busy days of photo shoots and research. I conduct research by nose, up close and personal, so we were up early the next morning. Even in May the days get hot; early mornings and early evenings are the best times to explore the North Reach Trail to Davis Dam. There’s a fascination to the river, even for a little yellow dog. It’s perfectly stationary, and yet it’s constantly moving. That is to say, it flows but it stays just where it is. It’s puzzling. I have to admit I’m a little miffed that the posse has absconded with one of the very nice bowls the Harrahs people included in my Doggy Swagbag when we checked in. They use it as a candy dish and think they’re very funny. My posse posts photos from our trips on my Facebook page when they get around to it. And I have a website here, take a look.